Preserving your past memories and more! Do you know the significance behind this photo? 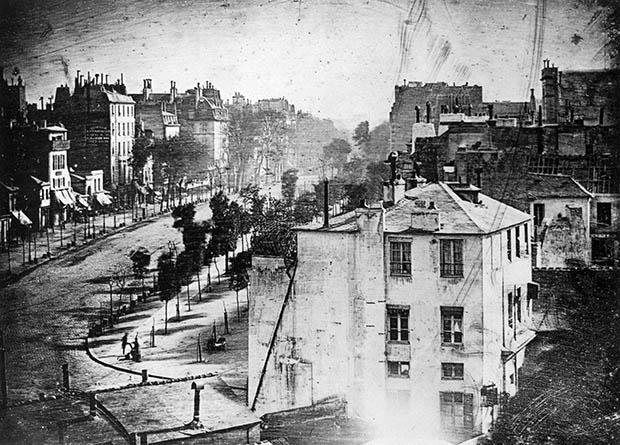 This photograph of Boulevard du Temple in Paris was made in 1838 by Louis Daguerre, the man that invented the daguerreotype process of photography. Aside from its distinction of being a super early photograph, it’s also the first photograph to ever include a human being. Because the image required an exposure time of over ten minutes, all the people, carriages, and other moving things disappear from the scene. However, in the bottom left hand corner is a man who just so happened to stay somewhat still during the shot — he was having his shoes shined. Good Day to everyone! Today’s subject is all about memory preservation and restoration. If you’ve ever visited the Leave A Legacy website you know that we have been working hard on many things. Our website (thanks to our awesome web guy) has been getting a major face lift. Not only has everything been re-optimized, we have added a handful of new videos. Recently, we have shot several how-to videos on preserving, cleaning, and taking care of your past media in general. As we move forward in time, your old media is slowly decaying. Your photos are fading, your film is becoming more and more fragile, and your memories stuck on old phones and laptops will eventually become difficult to recover. Electronics simply don’t last forever. It’s time to get serious about preserving all of those past memories. We’re sure you’ve heard all of the horror stories about cellphones dying, computers crashing, and things like floppy disks being rendered unreadable. Don’t let this happen to you! When you do go and grab that box of slides, be warned, that they may be dirty and dusty. Just because they are in a box doesn’t mean that they are protected from old media’s worst enemy, TIME! Our new how-to video on cleaning your slides is the first step in your line of defense against time! In it, Marsha Knackstedt, the owner of Leave A Legacy explains how-to and how-not-to clean your slides. It requires a solution (that is expensive) that will help remove dust and gunk off your slides. I’m sure your saying to yourself, “Wow, I really don’t want to spend the time to clean all of those slides.” No problem! That’s what Leave A Legacy is here for. Bring in all of those old, dusty, dirty slides into Leave A Legacy and we’ll clean them for you! But, we are more than just that, we can transfer, restore, and digitize them all for you. Knock two birds out with one stone! Now how about that 8mm/16mm film you shot when you were a kid? You know, that homemade movie you and your siblings shot one weekend so long ago. Well, film is a very fragile and moody beast. It is slowly fading as you read this post! Quick, grab it and bring it in to Leave A Legacy! Our team has the knowledge and equipment to restore and digitize it! We have the capabilities to transfer you film into a High Definition format that’ll look great on your flat screen TV. Do you have a giant box of VHS tapes in storage? Rescue them from that dark corner in your basement and bring them in! If you have a VHS tape that is damaged or broken, we can fix it! If you live far from one of our excellent locations, no worries, just ship it to us! Once we receive your media, we will call you and iron out the specifics of what you would like done. In the spirit of Colorado getting its first true snowfall, here is a great Calvin and Hobbes strip to celebrate!